Chances are, you’ve got a pretty good area of roof on your motorhome or campervan. So, why not make the most of it? Solar panels aren’t necessarily cheap – although for some folk they can indeed mean considerable savings on the cost of energy – but there’s a certain feelgood to getting electricity from as green a source as possible: direct sunlight! You can go as far as making your own calculations as to your vehicle’s power draw and what size (in Wattage) of solar panel you’ll need to sort this. To make things easier many suppliers offer some kind of calculator – or will happily advise first-hand. As well as getting the right panel to suit your needs, you’ll want a regulator/controller. Its main task is to ensure the batteries don’t get overcharged, and to tell you when charging is taking place, voltage levels etc. You get what you pay for here, with the more expensive and efficient units featuring maximum power point tracking (MPPT). 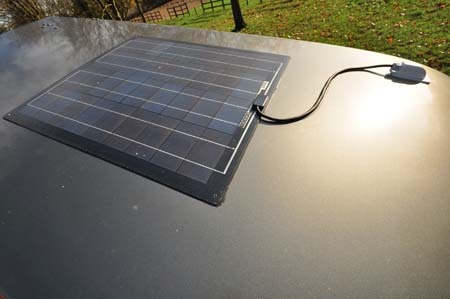 Solar panel kits will come with a suitable selection of cabling (make sure there’s sufficient length), fuse, gland (the weatherproof cover to fit where the cabling from the panel goes into the vehicle), fixings (screw and/or glue etc) and more. If you’re into DIY, a home fitting can save some money. Otherwise, as well as the specialists, most motorhome workshops have solar panel fitting experience. They certainly do. Direct sun is best, of course. But even when the weather isn’t so good, daylight hours will see you getting some kind of charge. Remember, solar panels don’t work if any part of them is covered. Anyone who’s got a solar panel on their motorhome will tell you it’s largely a fit and forget item that simply goes about its business with no further fuss. Of course, by obviating the need to connect to a mains hook-up everywhere you go, there are plenty of potential coast savings, too. Plus, as a fully renewable energy source, it couldn’t be friendlier to the environment. With Caravan Guard’s motorhome policy there are no special terms and conditions relating to solar panels. As with all modifications, you should notify your insurer if you fit solar panels to your motorhome. 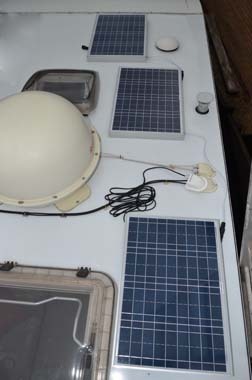 With Caravan Guard a solar panel is classified as a fixed item of equipment and hence its value should be included in the insured value for the motorhome itself. 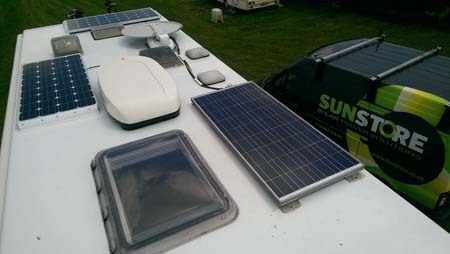 Fitting solar panels is likely to increase the overall value of the motorhome by at least a few hundred pounds so in order to remain fully covered, you will need to increase the sums insured on your policy. Things aren’t always straightforward on leisure vehicle roofs – and that’s where this clever kit comes in very useful. It starts off with a 40Watt Master panel and fitting kit, after which you can add as many as three more Slave panels – depending on how much power you want to supply, or what panel configurations you can fit onto your roof. It certainly means greater flexibility as you can manoeuvre around rooflights, TV aerial, heater flue etc. Each panel measures 66cm x 45.6cm and is 5.7cm high, weighing 3.8kg. The fitting kit includes a power controller, 5m of cable plus cable gland (ie protective cover for where the cable enters the roof), 35cm of female link cable with a waterproof cap, in-line fuse etc. Plus you get a set of instructions if you fancy attempting a DIY fitting. The future for solar panels? Slimline “flexible”, self-adhesive units like this, from the GB-Sol Reflex range are ideal for motorhomes. Because they stick direct to the roof – and they’re just 3mm in depth – they are highly discreet, and don’t act as a trap to debris, a regular criticism of panels that sit proud of the roof. These Reflex units are also semi-flexibly, making them ideal for roofs where there’s a slight curvature. Plus, they’re very light. This 70Watt example is 3.2kg, measuring some 74cm x 66cm, yet it can manage an 18.7 volts output and a 4.8amp peak current. Because of their adhesive nature, there’s just one hole to drill, for running the cable into the vehicle below. As per the above, panels can be linked together. Any time of year is a good time to consider solar, even winter. Even if your vehicle is not in use, if it’s outdoors a solar panel can be sufficient to trickle charge the leisure and/or vehicle battery and prevent issues with alarms/trackers etc draining power. Caravan Guard Gear Guides aim to give you an introduction to a specific product sector. But, we’re always keen to hear from you if you want to share your experiences or advice with other Caravan Guard fans. See below to add a comment. Do you have a list of recommended fitters for solar panels ? I live in Surrey so if you know of any round here that would be great. I have a swift 630G motor home. Which flexible solar panel do you recommend. More output the better. I’ve fitted a single 280w mono on my Kontiki 669. It produces 19amps on a sunny day and the lowest produced was 0.9amps during a storm. Across the board this is enough to keep two 110ah leisure batteries charged and gives me complete freedom from hookups. Perfect for tramping the lesser visited areas of Scotland and Europe. Bimble Solar near Lewes in E Sussex supplied the panel, Mppt regulator and cable, excellent little company, full of knowledge and not purely interested in profit. Total costs for the system £338.00. With such a large panel 180cm x 90cm it’s wise to fit down with at least 10 “glue down” brackets, plus I fitted a small spoiler to deflect wind and reduce any chance of lifting. Wattage may be a bit excessive, but better a little too much than run out and have to run the generator. I have just fitted a 300w system on my RV. A DIY install with all parts purchased via eBay including controller, remote monitor, 2x 150w panels, mounting brackets that can be andled if required and all specific cables. System runs a split charger and you can manage the power to each battery bank from the controller. It works amazingly and in good sunlight produces 19 amps! Total cost £330 and 3 hours to install. Slightly over the required specification but can run an inverter for hours and now never require mains power. Fitted a 60W Solar Panel Package to my 2006 Symbol roof, worked great, helped by changing the six internal flourecent lights (8W each) to LED Strips (1W each) and also have Avetek TV. We do a lot of Aires & also had a 7 days spell on a site without hook up, some days cloudy our 75AmpHr leisure battery kept charged no problem. Can recommend if energy use not to high. Word of warning check if you plan to fit a Duel Battery Controller that can charge both Leisure & Starter batteries, I haven’t yet found one so far that can, we ordered a dual battery charge Controller to do this, but it wasn’t until it arrived we discovered from info that came (not told when we ordered) with it & confirmed by supplier one of the batteries had to be totally isolated from the other, not the case on a motorhome as Alternater & 240V charger effectively link & charges both of them, so could only connect one to the Panel. It all still works, but will be changing controller at some time, if I find one to do the job. Would also recommend fitting twin pole fused spurs on cable from Panel to Controller and cable to battery, makes it easier to isolate them, if you need to disconnect e.ther. Thanks for your comment, some great insightful points that I’m sure others reading this will find useful. Hi I’ve change from my motorhome which i insured with you. To a caravan. can i still insure with you. Hi A Kirkup, of course! 🙂 There’s a wealth of information on our touring caravan policy here. Or to find out where you can save with our safety and security discounts, see here. Alternatively, if you’d prefer to speak to someone, you can call us on 01422 396 769 (Mobile friendly).